Today we have a guest post from the very smart Kathryn Gamble, a new consultant on my team. She’s an expert on discovering major gifts. I’ve worked with Kathryn for over 20 years on various projects and am so pleased she was willing to come join the Gail Perry Associates consulting team! Kathryn is a brilliant fundraising strategist who likes to raise money by the numbers. I’ve never seen anything like it. 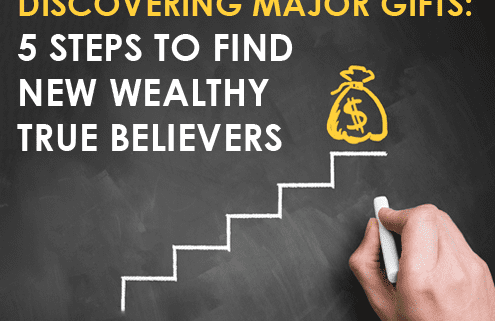 Today, she’s sharing her favorite 5 steps to “discover” new wealthy prospects – something that we ALL want to do! 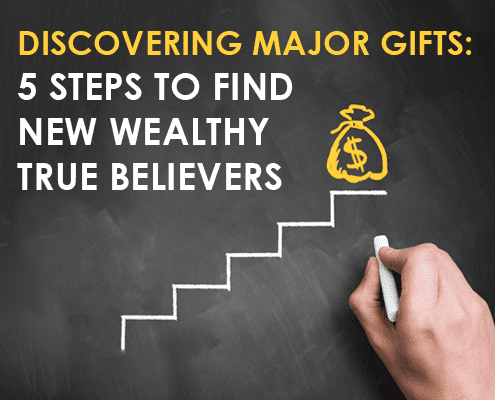 Finding new potential for major gifts can seem like an overwhelming undertaking. If you want to start discovering major gifts, here are 5 steps that are guaranteed to bring you success. 1. Make Appointments With Yourself. Yes, it is important that you schedule time for major gift work. The very best major gift fundraisers are disciplined and focused! So, whip out that calendar and block out time each week to execute the following steps. You want to know who to put on your major prospect list? Look at current donors who have high frequency giving. I am sure you have donors who give your organization $100, $500, $1,000 or more every year. You may have some who have given more than once in a single year. Set up a query in your database based on frequency of giving. Once you have the raw data review it carefully. Remove people you know well. Organize the list in order of giving history ranked top to bottom. HINT: Always work your list top down. Now you have a list of who have indicated they love what you do and may have potential to do more! Now, your job is to find out more about them. I have my list in front of me. Now what? Thank the donor for their loyal support and let them know you would like to meet them to learn more about why they support you. If making a call cold leaves you frozen (!! ), try this. Start with a note of introduction letting them know you plan to call. Nothing beats a nice handwritten note to get noticed. IMPORTANT – If you send a note, you MUST follow-up quickly with the call! No need to be nervous if you are prepared. Plan your meeting. Every meeting you have with a donor must have a goal. The goal for these types of discovery meetings is to determine the interest and ability of each donor to make a major gift. 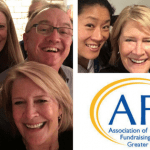 Listening to the donor is key – this call is not about selling! Here are some questions you can use to get the conversation rolling and what you may learn from the answers. What are your impressions of our organization? Answers to this question will tell you why the donor supports your mission. Which aspect of our work is of most interest to you? These answers will indicate how much the donor knows about your organization and what they may want to know more about. What excites you most about the giving experience? Donors will share what they like about giving – some will talk about recognition; others about how they feel. This will help you understand more about their motivation. Usually what you learn from this question is something about ability. They may mention serving on a board or participating in a campaign of another organization. The best follow-up is planned in advance. And, follow-up must be done quickly. Prior to the meetings consider what your follow-up options may be. These include tour of your campus or site, visit with the CEO, and additional written information. You also might want to followup on something within your donor’s area of interest. Suggest a follow-up step to the donor prior to leaving the meeting. And, always send a personal thank you note to the donor. 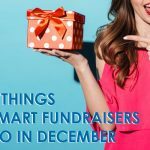 It’s not as hard as you think to discover NEW major gift prospects – right in your own donor files. Are you ready to start discovering major gifts for your wonderful organization? Then check out our 2018 Major Gift Coaching Program – we have just opened it up for applications and would love to talk with you. Kathryn will be one of the coaches helping you find and close new major gifts for YOUR cause. You’ll love working with her.